Venomous Water Moccasin or Harmless Watersnake? Harmless Watersnake or Venomous Water Moccasin? There are many harmless watersnakes (genus Nerodia) that are frequently confused with venomous Water Moccasins a.k.a. Cottonmouths (Agkistrodon piscivorus). 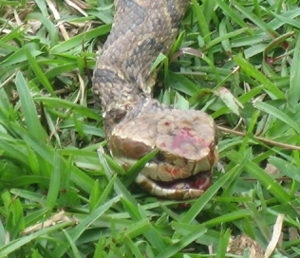 Sadly, harmless snakes are often killed out of fear for the safety of family and pets. Most people, even those who aren't afraid of snakes, would feel safer if they knew how to rapidly identify snakes near water as harmless or venomous. So how can you tell them apart? CAUTION! -- With practice, you can learn to tell the difference between watersnakes and Water Moccasins. Even non-venomous watersnakes will bite, so the best policy for dealing with snakes is to "leave them be" to play their important roles in our ecosystem. THICK, HEAVY BODIES: Venomous Water Moccasins have bodies that are VERY thick and heavy for their length, and short, thick tails. 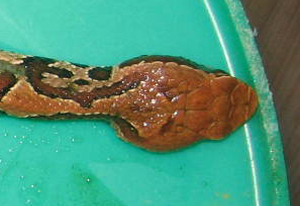 A harmless snake the same length would be much more slender and would have a much longer, thinner tail (see below). LONG, SLENDER BODIES: Non-venomous watersnakes (and other harmless snakes) have bodies that are more slender for their length, and longer tails. 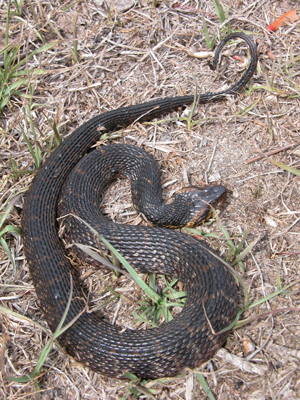 This Brown Watersnake has a slender body and has a relatively long, thin tail. Notice that the head is also narrow. **FLATTENED BODY: harmless watersnakes often flatten their bodies and heads when they feel threatened, making themselves look much larger and more menacing. 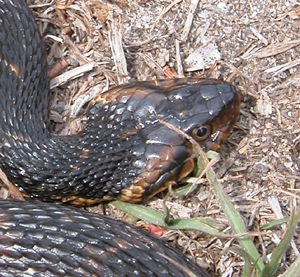 This Banded Watersnake feels threatened and is flattening its body and neck. 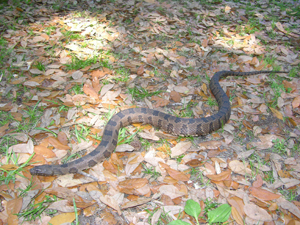 However, for its length, the body of this snake is still more slender than the body of a water moccasin, AND the tail is much longer and thinner. 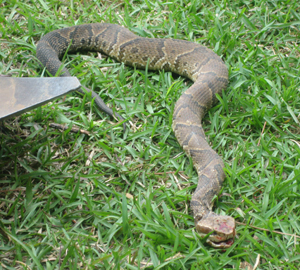 LARGE, BLOCKY HEADS: Venomous Water Moccasins have large, blocky heads and their necks are distinctly narrower than their heads. SLENDER HEADS: Harmless watersnakes have slender heads that are more narrow and less blocky, and they lack obvious necks. This Banded Watersnake has a slender, elongate head that blends into the body smoothly, with no obvious neck. 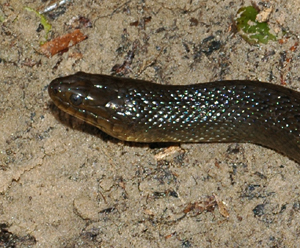 This Green Watersnake also has a slender head and no distinct neck. FLATTENED HEADS: Harmless watersnakes often flatten their heads into a triangular shape when they feel threatened, but their heads look flattened rather than thick and blocky, and their necks are not distinctly narrower than their heads. This Banded Watersnake feels threatened, so it has flattened its head and body to appear more menacing. 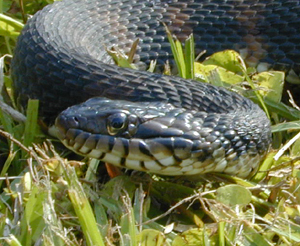 Harmless watersnakes often flatten their heads when they feel threatened, making their head look triangular--but notice that the head looks flattened, not thick and blocky, and the neck is almost as wide as the head.